In this category, I take a peek at and talk about the latest or hugely popular, and best apps the android world has to offer us. This includes rumors and features. You'll find in-depth user experiences regarding some of the popular apps of various categories. I'll also post updates on Android Applications that have interesting updates with intriguing features and benefits. Back in my days the only thing I knew or considered as "technology" was the Television that we had. But now, Now it’s a totally different game for kids of this generation. As technology progressed and had a boom in availability, many amazing things have been invented or improved. And kids nowadays have access to pretty much all of them. Whether it’s a smartphone, smart … [Read more...] about Best Parental Control Apps for Android that You Must Try! 7 Best Android Keyboard Apps in 2018 You are Missing Out On! 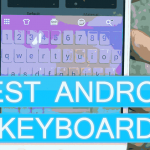 The best Android Keyboard Apps!!! Arguably the most sought after app of any android device of all time. Use of the keyboard app is unparalleled and unprecedented. You want to text your mom? You use the keyboard. You wish to post something on facebook or tweet? You use the keyboard. You can’t possibly use a smartphone without a keyboard app. Luckily for us, every single … [Read more...] about 7 Best Android Keyboard Apps in 2018 You are Missing Out On!